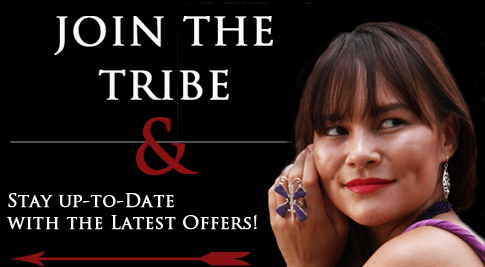 Be prepared to be dazzled, this area of our catalog features a wide variety of onyx bracelets, one of our most popular examples of Native American bracelets. Many people love this stone for its elegance and sharpness. It can really spice up something simple and add style. 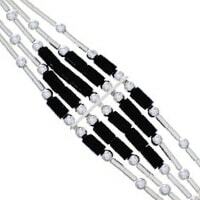 Its popularity continues to grow, as it is perfect for any outfit and matches with everything. Most commonly, the stone is black but you can also get onyx in many other shades, some of the shades that we offer are blue and green. 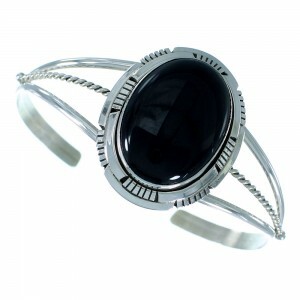 Onyx, when put into a lovely silver or gold cuff bracelet, can create a sleek contrasting look that is absolutely gorgeous. 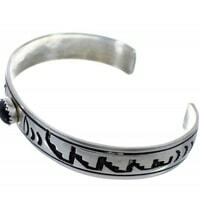 If it is mixed with Southwestern and American Indian designs, it can create the most beautiful piece. 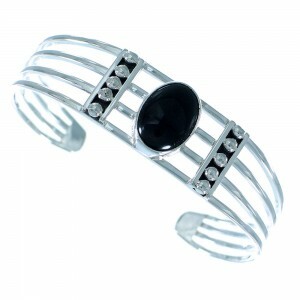 Our selection of onyx bracelets is incredible; we have many different sizes, styles and variations to choose from. Whether you are looking for something that is small and delicate or something large and elegant, we have the right onyx bracelet for you. This lovely stone is a form of quartz called cryptocrystalline. It has been well known for some time and recognized by the ancient cultures from around the world. It was used to make bowls and other pottery items as early as the Second Empire. 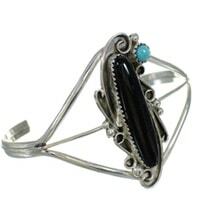 The Navajo and Zuni tribes have been using onyx in their art for many years. 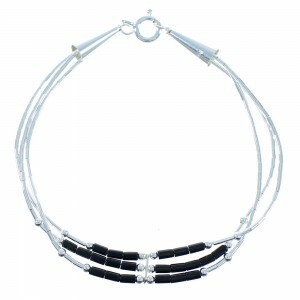 They have been wearing and creating stunning jewelry that includes black onyx bracelets for spiritual and fashion reasons. 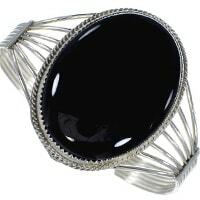 Depending on the tribes and its traditions, the different artists create some of the most beautiful styles of onyx bracelets. Our onyx bracelets have a little bit of mystical beliefs behind them. It is the birthstone for August and is considered to be a lucky charm for those with the sign of Leo. 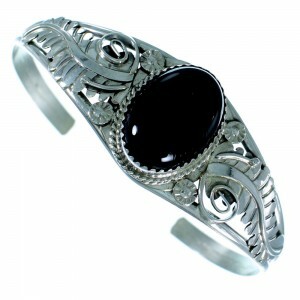 Gemologists believe that onyx can be used as a protective measure for harmonious relationships. 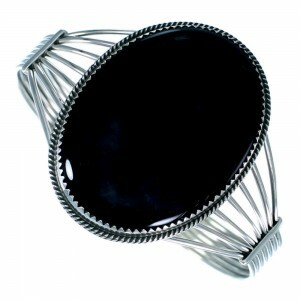 Another belief is that when onyx is worn it can help enhance self-confidence, responsibility and increase self-esteem. 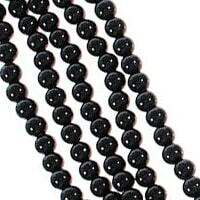 People also wear onyx bracelets to get negativity out of their lives. 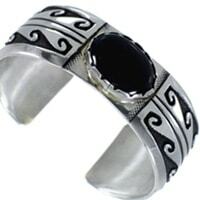 So go ahead and bring some mysticism into your life, get yourself or someone you love a black onyx bracelet and put the spiritual aspect of this stone on your wrist. 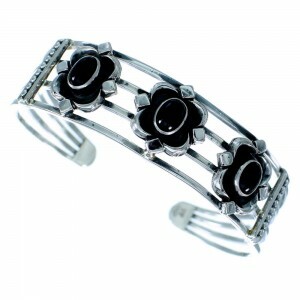 We even have inlay cuff onyx bracelets as well as onyx Link Bracelets. 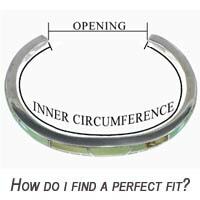 All these different styles are made to be easy to put on and take off the wrist! 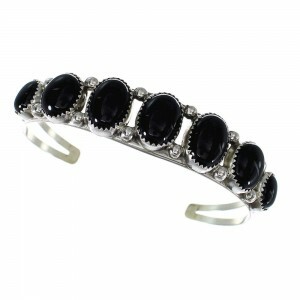 We also have Onyx baby bracelets that are absolutely adorable. Why not have your baby look stylish too! 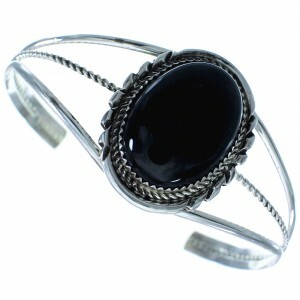 Whatever style of Native American Onyx bracelet you go with you will look fabulous. If ever you are stuck on what to get someone because you have no idea what their favorite color may be, you are always safe with picking an onyx bracelet, as it will match anything they like to wear. 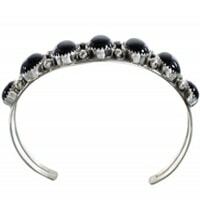 Perhaps you're wondering what to get a friend or family member for that special occasion, consider an onyx bracelet; it can make the perfect gift.